Rent a Pony Ring for your next event. 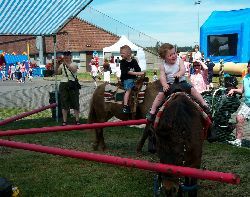 This fun-filled amusement includes up to 6 ponies and the staff to handle everything. For smaller events like birthdays we often recommend a hand led pony or two. Ponies are attached to the ring and walk in a circle. The handler controls the speed and movement of the horses. Ponies are trained to work well with public. Note: Plan for the location of the ring to have wear from the ponies.